I’ve been using several items from MyChelle for a few months now. The verdict is in! Here are my reactions to some of their best sellers. MyChelle products are typically very clean and green but double check the ingredient list and the EWG Skin Deep site as some products aren’t as “natural” as I’d like. 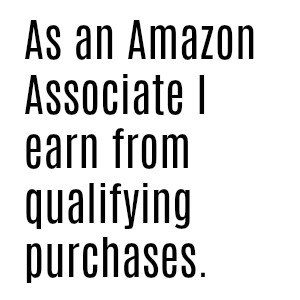 I had a gift card (full disclosure: I won a contest via their Facebook page) so I ordered my products from the MyChelle website, but you can also find their stuff online via Vitacost and you might find them in some local stores. UPDATE: I just saw a huge display of MyChelle at Whole Foods so their distribution might be expanding! 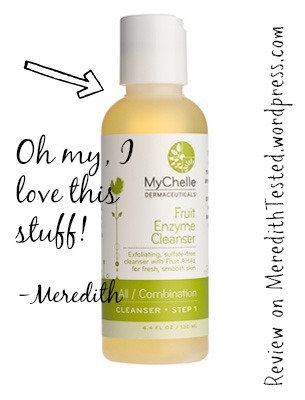 Fruit Enzyme Cleanser, $10-$18 (EWG: 1) … The smell is nice and it goes to work on my makeup and dirt/grime without making my skin feel like I did anything to it. It’s not “creamy” but it still feels nice going on. I put a dime-sized amount in my palm and then mix with warm water before applying in small circles all over my face and neck. My husband also loves it. When we ran out we switched to a different cleanser (an organic Body Shop one) and we both had small breakouts pretty much immediately. Back to Fruit Enzyme Cleanser we go! Honeydew Unscented Cleanser $10-$18 (EWG: 1) … There is a slight smell but after getting used to the enzyme cleanser this one just didn’t hold up. I have the small container (2.1 oz) so I’ll definitely keep it in my travel kit but it’s not a go-to. Oil Free Grapefruit Cream $31 (EWG: 2) … First let me say that this lotion is definitely not for the Winter and/or anyone with even slightly dry skin. I eventually started to like this but at first I was not a fan of the scent and the slightly tacky/sticky way my skin felt after applying. It does absorb after a few minutes. I think this might be good for someone with very acne-prone skin, not someone like me with normal-to-combination skin. I always ended up applying more of this lotion or a different lotion to get a bit more moisture. Cream Foundation $27.25 … This almost went into my “won’t repurchase ever” pile until I figured out that it applies pretty well with a buffing brush (I use the one in this set from Real Techniques.) It did not apply well for me with fingers, a beauty blender or other sponges – I ended up very splotchy every time. It almost separated on my skin and floated around, if that makes sense. It is definitely not a good fit for me for summer as the finish is quite shiny and sweats almost immediately off. However, I liked it for winter months when my skin could handle a bit more moisture. I did end up popping powder on top almost every time I used it, though, for better staying power and to remove some of the sheen. Smells great. Weirdly great. Concealer $13.50 … This smells nice (probably due to the guava extract) but just never gave me the coverage or texture/finish I wanted. I typically use concealer for two reasons: darkness/pigmentation around my eyes and nose and some very old acne scars, and on blemishes. Even with a powder to set, this did not work for blemishes for me. It worked a little better around my nose and under my eyes, but again I felt I had to set with a lot of powder and it didn’t last very long. I know other bloggers/reviews rave about this little stick, but my experience was lack-luster. Apple Brightening line … see above.